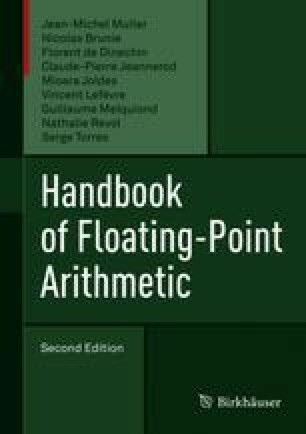 In this chapter, we focus on the computation of sums and dot products, and on the evaluation of polynomials in IEEE 754 floating-point arithmetic. Such calculations arise in many fields of numerical computing. Computing sums is required, e.g., in numerical integration and the computation of means and variances. Dot products appear everywhere in numerical linear algebra. Polynomials are used to approximate many functions (see Chapter 10). M. C. Brunet and F. Chatelin. A probabilistic round-off error propagation model, application to the eigenvalue problem. In Reliable Numerical Software, 1987. Available at http://www.boutell.com/fracster-src/doubledouble/doubledouble.html. M. Lange and S. M. Rump. Sharp estimates for perturbation errors in summations. Manuscript available at http://www.ti3.tu-harburg.de/rump/, 2017. W. F. Mascarenhas. Floating point numbers are real numbers. Manuscript available at https://arxiv.org/abs/1605.09202, 2016.